Three young musicians with varied musical backgrounds united their creative and artistic forces to form the group É.T.É. Its members, Élisabeth Moquin, Thierry Clouette and Élisabeth Giroux, offer a very dynamic and modern vision of Québec traditional music. 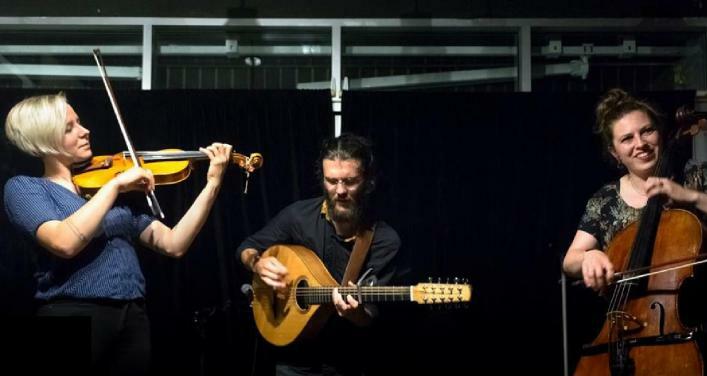 Their musical arrangements are shaded with influences of folk, progressive rock and classical music interpreted on fiddle, Irish bouzouki and cello. Élisabeth Moquin also adds a special colour to the group’s appeal through her masterful step dancing. The musical vision of the three performers is presented in their original compositions and unusual arrangements of traditional tunes. With rich vocal harmonies, musical drive, instrumental virtuosity and remarkable on-stage complicity, É.T.É transforms the traditional kitchen party into an unforgettably entertaining and lively performance. É.T.É’s first album entitled “Le boire des minuits” was released in 2017. Since then, the group has received an award in the category Émergence of the Grands prix Desjardins de la culture de Lanaudière 2017 for new young groups in 2017. They also received a prize voted by the public during the Cabaret festif 2018. The group continues its momentum by touring in various parts of Québec, the Maritimes and in western Canada.